Reminders, reminders. And more reminders. Tweet your elected officials! Tell them to #Vote4DM! Maybe you were getting ready for last week’s DSMA Twitter chat and you started noticing all of the tweets going out from the Diabetes Community to House members and Senators here in the USA. Do you know where that started? It started at Strip Safely, who started the campaign and even provided this nifty web page that made it super easy for people to Tweet their elected officials about coordinating the federal response to diabetes, covering CGMs for senior citizens on Medicare, and permitting Certified Diabetes Educators to provide already approved education benefits to their patients. Guess what? There will be a brand new Tweet-In again tonight (October 29) beginning at 8:00 p.m. eastern time. 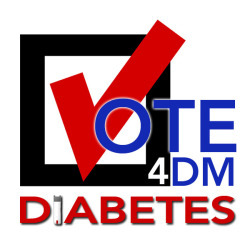 Once again the Diabetes Community will be showing strength in numbers by massively tweeting the lawmakers we elected and letting them know how important it is (less than a week before election day) to make diabetes an integral part of the legislative landscape. And soon. It will take less than five minutes for you to be an advocate. At 8:00 eastern time tonight (US)– You can help by going to this page, finding your congressperson and senators, and clicking on the specific links listed to either encourage the people (that we elected) to take up the cause, or to thank them for already doing so. I’m very much looking forward to the conversation (via webcast) that will be taking place on Monday, November 3 beginning at 1:00 p.m. eastern time (US). This is a chance for you to learn more about the U.S. Food and Drug Administration, how and why they review devices and drugs, and how we, as a community, can work with the FDA toward better outcomes in all areas. To RSVP for the webcast, go to this Diatribe link or this FDA link, get all the information, and register. Once you’ve done that, you’ll get a look at the agenda and a link to join the webcast on Monday. I hope you’ll be there! The Big Blue Test is going strong. As of this writing, there were over 1600 Big Blue Tests recorded so far. But that’s a far cry from the goal of 35,000 set for this year’s event. Don’t forget… Now until November 19, every Big Blue Test that is logged will result in a $1.00 (US) donation to non-profit diabetes groups that are working tirelessly to provide education, support, and supplies to people who need them. My guess is maybe you’ve forgotten to log all of your activity. Well what are you waiting for? 4. Share your results. Answer the questions in the right column of the page at bigbluetest.org. And don’t forget to talk about your experience on social media using the hashtag #bigbluetest. So there you have it. Three great ways to learn, stay active, and hold congressional feet to the fire for People With Diabetes. It’s not always about big projects with huge budgets and lots of manpower. Sometimes it’s as simple as saying, “Yeah, I can do that” and making a small effort. And while I’m at it, let me say: Thank You for your advocacy. Your efforts continue to make a difference. This post is also published on the Diabetes Advocates website. Take the Diabetes Advocacy Survey, join us, and become a Diabetes Advocate right now. This post will wait until you come back. 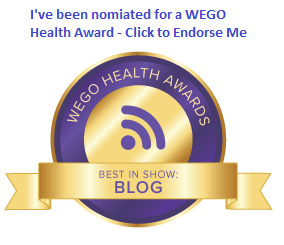 When I first discovered the group of bloggers, reporters, healthcare professionals, and patient advocates that make up the Diabetes Online Community, I remember feeling really good about the support and encouragement I was suddenly finding through the internet. I did not know much about the U.S. Food and Drug Administration, other than knowing that they had to approve every new drug or device used to help me survive with diabetes. Then I started reading a lot from people who felt that the FDA was holding back progress on these things. How the FDA never took the patient point of view into consideration. How they were a bottleneck, holding back advancement toward better outcomes for us. Well, I’m not sure if that was entirely true then. But I do know now that it is not true today. Last year, Strip Safely helped lead a campaign to get more people to comment on FDA draft guidance for glucose meters. We were all encouraged to post comments letting the FDA know how important greater accuracy and post-market inspection is when considering the trustworthiness of new glucose meters and test strips. We were able to post those comments directly to the FDA because they made it possible to do so, easily, online. As a result of just that one push to comment, the FDA received six hundred comments on this one issue. That’s about six or seven times the number of comments they generally receive on draft guidance. Collectively, and as individuals, the diabetes community spoke and the FDA listened. But that’s not all. A few weeks ago, I received an e-mail from the Food and Drug Administration about comments I left regarding glucose meters in a point-of-care setting (hospitals, doctor’s offices, etc.). They wanted to speak to me about what I had written them. So we scheduled a time, and I spoke by telephone with Katherine Serrano, Deputy Director of the FDA’s Division of Chemistry and Toxicology Devices. We talked about some of the things I had written, and she had a few questions for me. The thought of that seems a little intimidating at first. But rather than just a talk between a Deputy Director at FDA and a guy from Baltimore, it was really a conversation between two people discussing an important topic. I tried to give her my passionate best on the subject, and she remained engaged, asking follow-up questions and allowing me to consider her questions carefully before answering, and even letting me e-mail her later with additional feedback. This does not seem like the actions of a group that does not care what we think. I don’t know how seriously Ms. Serrano or the FDA considers my views on the subject. But there’s no denying the fact that I was given not one, but two chances to deliver a personal plea for the best possible device guidance on point-of-care glucose monitoring. And I was not going to pass on either one of those opportunities. Because new innovations often take years to get into the hands of the people who need them most, it’s easy to feel like your voice would get lost among the masses, even when you do take the time to respond to something. But what’s the alternative? You, or people you love, are the patients, the ones most affected by any changes to the status quo. The one way to be sure your concerns are part of the public record is to make them public. The one way to help all people with diabetes get the better outcomes they deserve is to insert your voice into the conversation. And if you’re asked for additional perspective, be sure to speak with the passionate desire for the absolute best results that comes with the perspective that only you possess. We’re counting on you. Allow yourself to be the voice that makes the difference.